After more than 50 hours of testing with different moms and babies, we conclude that the best baby bassinet for most moms and babies is the Arm’s Reach Concept Co-Sleeper Bassinet Mini Arch, Natural. 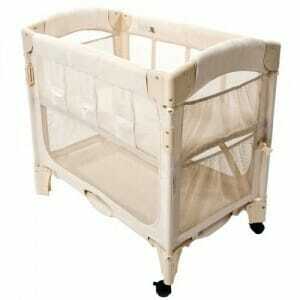 This is a popular bassinet that many consider to be most convenient and a safer alternative to bed sharing. The bassinet allows you and your baby to sleep next to each other with a lot of ease and comfort. It is very sturdy and stable and ridiculously easy to set up. Another good feature of Arm’s Reach is that it doesn’t take up more space. The baby has room to spread out the way she likes, and one can quickly check on her through the night and then drift back to sleep. The Bassinet has pockets on the side that can pack extra pillow case as well as breast pads and lanolin that are invaluable during night time feeding. According to Arm’s Reach official website, they introduce the bassinet as the ideal sleep solution for any concerned parent. In our research, we compared the bassinet with others and can strongly recommend it as a great product that makes life with a newborn so much easier. Go ahead, spend your money to get this bassinet to keep your baby safe. We promise you won’t regret it. Our step-up pick, the Hallo Bassinet Swivel Sleepers is the most convenient bassinet in the market. It is safe and comfortable and significantly reduces the Natural risk associated with bed sharing. Your baby is closest to you hence easy to take care of the child. It has an auto- return functionality that ensures that the child sleeps safely. The best of it is that you can lock it in the upright direction or in any position you desire. The mattress is waterproof which means you don’t require a waterproof pad. The mattress can be propped off from one end which helps babies with reflux. Hallo Bassinet Swivel allows you change the diapers while seated. The side pockets are capable of holding two new born baby diapers and wipes. This product has a soothing Centre with buttons that work simultaneously producing both sound and vibration. It is the top pick for those who plan to have or those who have had a caesarean section for it is designed with the healing mother in mind. Hallo Bassinet Swivel Sleepers is a great product that we unreservedly recommend to those who won’t mind spending more for a bassinet that has more features and especially for C- Section cases. Famed as the only Bassinet that rotates 360 degrees, the Bassinet Swivel Sleeper has the benefit of allowing your child sleep closest to you. Our budget pick, the Delta Children Sweet Beginnings Bassinet is specifically designed for infants up to 15 pounds. It has an adjustable, removable canopy, comfortable sleeping area with fitted sheets. The bassinet is a classic sleep area for a baby that features a neutral leaf pattern, with elegant fabrics and a sleek profile. It comes with a night light and attached music module that features a few preloaded lullabies. Delta Children are faithful to their founding idea of making high-quality bassinets available for all families. We picked this bassinet as our budget pick and recommend it to all those families that have a newborn and need a bassinet without necessarily spending a lot. When you have a new born or you are expecting the arrival of one soon, it is important to budget for a baby bassinet. Looking for the most convenient bassinet can be a daunting task. Without an in-depth research, you can end up with a bassinet that is not convenient for you and your baby. I would like to discuss on what you should know and factors to consider before buying a bassinet for your kid. Safety of the newborn is a must consideration when purchasing a baby bassinet. We recommend you go for a bassinet with mesh walls because it allows free flow of air. A bassinet with mesh wall meets the standard set by the American Society for Testing and Materials (ASTM). In our research, many people complained that the bassinet mattresses were stiff. We would like to inform you that the ASTM standards requires a bassinet mattresses to be firm because they help reduce SIDS. The size and weight of the bassinet will depend on most likely your intended use. If you intend on moving the bassinet around, you should consider purchasing a lighter and smaller unit. But, if you want the bassinet to be in a stationary place, then the purchase of a heavy and bulkier unit can work for you. Be careful to find out whether the material that is used to make the baby bassinet is clean. A good material should not contain potentially harmful chemicals in their products. Ease of cleaning is a major factor to consider. In our research, we found the Hallo Bassinet Swivel Sleeper to be a champion when it comes to ease of cleaning compared to other brands. If you will frequently be moving, it is advisable to go for a bassinet that can break down or easily be folded and transported. A portable bassinet must also be stable and durable lest it breaks during transportation. A bassinet or cradle is a bed made specifically for newborns up to the age of four or five months. Bassinets are usually small so as to enable easy portability. They also have a hood that is pulled over when the baby is asleep. To come up with the best baby bassinet wasn’t an easy task. We had to compare many different types and makes from different manufacturers. Ideally, we were looking for features such as the size of the bassinet, heaviness, portability, sturdiness and durability. The price of the bassinet was also an important criterion. Another issue that we gave consideration to was the design and the materials that were used in manufacturing the bassinet. Safety features and compliance with set international standards also informed our choice. In our research, we came out with Arm’s Reach Concept Co-Sleeper Bassinet Mini Arc as our topic pick. The product was a winner on most of the criteria we subjected the bassinets. We ended up with Hallo Bassinet Swivel Sleepers as our step-up pick for those who don’t mind spending some more dollars on a bassinet that is cool and has extra features. We also cared to announce our budget pick the Delta Children Sweet Beginnings Bassinet. It is a small bassinet that is famous with many families. The Delta Children’s pricing is most competitive allowing all people from all walks of life to get a hold of this important product. The bassinet is a safer alternative to bed sharing as it attaches to parental bed thus making it easier for nighttime nursing and comfort. It is mostly chosen for the convenience it provides. The unit has four breathable mesh and wheels on one end for easy movement. It is highly recommended for mothers recovering from C-section. This bassinet is conveniently portable, folds easily and fits into a 10″x10″x32″ nylon carrying case with sturdy carrying strap. The unit has a co-sleeper mode as well as the freestanding bassinet mode. The bassinet’s sleeping nest has a height of 4 inches. It conforms to all ASTM and CPSC standards and also the JPMA certification. We liked the fact that it has a selection of pre-loaded lullabies that will help to soothe and send your baby to sleep. Another feature that captured our attention was the adjustability of its canopy. It can move up and down, and it can completely be removed. The adjustable canopy enables you to style the bassinet to your liking. Arm’s Reach Concept Co- Sleeper mini is our champion. We recommend to you this unit that doesn’t need much space and has all the necessary features you would like to see in your bassinet. Remember it is portable which means that you can be mobile with it. The unit is designed to cater for a newborn up to the age of 5 years. This means that on reaching the age, the baby has to be moved to another bassinet. In our research, we received a lot of complaints from parents who complained that the arm’s reach Co Sleeper’s mattress was stiff. That’s what the doctors recommend for a newborn. About the baby outgrowing the bassinet, our argument is that the bassinet is a specialty for the newborn, it is invaluable for housing the newborn when it is delicate, which is the most sensitive time in a child’s life. Our step up pick the Hallo Bassinet Swivel Sleepers is an ideal bassinet for a mother recovering from C – section. The bassinet can deliver a complete 360 degrees rotation. The Bassinet Swivel Sleeper supports a nursing mom in two important ways. Firstly, its cool design, and retractable wall feature makes it convenient and hustles free for mom to reach in and lift a baby while in bed. It also allows mom to return the baby without getting out of bed. Secondly, the bassinet comes with a nursing timer that allows the mom to set an alarm to remind her when it’s time to return the baby to his bed or switch sides. Any mom who has gone through a cesarean section birth can tell you that recovering from it can make any movement painful let alone lifting the baby. Our step-up pick, the Hallo Bassinet Swivel Sleeper enables the mom to tend to her baby’s needs without getting out of the bed. The bassinet is vital in the process of bonding between the mom and the baby. The retractable walls make it easier to pick her baby while the mesh wire allows her to see her baby. The bassinet can be used on either side of an adult bed. The low profile, the four-point base is designed to accommodate virtually all bed heights. The bassinet can be used on bare as well as carpeted floor. To achieve maximum stability, it is important to ensure that all four legs are placed either on or off the rug. Moving of the bassinet is made easier because the cradle disconnects easily from the base hence, the cradle and the base can be moved in two pieces. This is the bassinet for every family. Its affordability makes it a leading seller at Amazon. It is sturdy and easy to assemble. The bassinet is ideal for infants up to 15 pounds. It has dimensions 33″Wx17″ Wx45″W and weighs 10.5 pounds. It is made of a steel frame and polyester fiber pad. Its fabric machine is washable. It’s convenient, lightweight frame supports easy portability while the locking casters necessitate easy room to room mobility. The bassinet meets all ASTM and CPSC standards. Delta Children Sweet Beginnings Bassinet provides security while also delivering on style and adjustable canopy. The unit has an electronic music module with a nightlight and gentle vibrations. The bassinet helps parent establish healthy sleeping habits right from the start. The bassinet is available in various colors such as turtle dove, falling leaves, olive and lattice. We recommend this bassinet as our budget pick for anyone with a baby. Faithful to the spirit of Delta Children, the pricing of this simple yet fantastic unit has the effect of allowing any mom in need of a bassinet get a hold of one. We really liked the features that come with these bassinet given its price. Though not anywhere near our top pick or even the step-up pick, we submit unreservedly that it is the bassinet of choice for those looking for a basic bassinet that meets all the standards. This is a bassinet that is designed with portability in mind. It is designed with mesh panels, breathable fabric, and a locking frame and provides both comfort and peace of mind. It has a Four-Point safe T- Lock System for safety and security. The double locking tubular steel frame is strong and durable. The mesh panels provide maximum airflow for comfort and ease. The bassinets folding feature is great for portability and storage. It breaks down compactly so that you can throw it onto the back of your car seat. We recommend this light durable and safe bassinet for those who are constantly on the move. It is also perfect for picnics or outings with friends. This is a piece of classic design made from Radiata sustainable Pine Wood from New Zealand. The offer comes with a cradle pad included. Easily converts from bassinet to a toy box. It has none – toxic finish and is safe from lead and phthalate. Meets all ASTM safety specifications for bassinets and cradles. It offers wonderful convenience and features X- cross and flat bottomed legs for an extra safe and stable cradle for your baby. It is an ideal, eye – catching elegant bassinet that affords your comfortable baby sleep. It is superior regarding safety. It is perfectly engineered so as to be sturdy. It is made of top notch materials. The design is airy and soft; there is no bars or loose parts to trap the tiny hands or feet. The unit lulls your baby to sleep which has the effect of making your baby relax and fall asleep. It also allows easy supervision of the baby. You do not need to buy a crib bumper because the sides of the cradle are made of fabric. The cradle is easy to rock with your hand or foot but also turns your baby’s own movements into gentle rocking. The bassinet easily meets all international standards regarding quality and safety. We recommend BabyBjörn – Cradle as a substitute for those who are not able to get our top picks. Its design features an inclined surface that allows babies sleep on an incline. These helps give both baby and mom peaceful nights. You can peacefully remove incline sleeper attachment for use as a traditional bassinet. According to the manufacturer, this is the only traditional bassinet that offers an option to help babies sleep when they suffer from colic or congestion. They claim that the bassinets inclined surface was developed in conjunction with doctors to help alleviate congestion. The product has a light Vibes electronic unit with classical music, nature sounds, variable vibrations, and soft-glow check light. It has locking wheels that enable the room to room mobility and conveniently converts to a rocky bassinet. The mattress comes with washable fitted sheets. This is another piece of product that impressed us mostly for its simplicity and yet eye- catching design. It has melodies, calming sounds and vibrations helpful to lull the baby to sleep. We found out that it has four musical melodies, two nature sound, one womb sound and soothing vibrations. It has wheels that enable you to move the bassinet from room to room effortlessly. The offer includes quilted bassinet sheet with embroidery detail. Above all, its espresso stained high-quality hard wood compliments any décor. We highly recommend this unit as a substitute of our main picks. As the name suggests is a wonderful soothing piece with four musical melodies, two nature sounds, womb sounds, and soothing vibrations. The vibration feature can be turned on for more relaxation. All motions and music have a twenty-minute timer with auto-shut off to extend battery life. It is a wonderful quilted bassinet with embroidery. It has a large storage basket and an adjustable canopy and also locking casters for safety. The adjustable canopy helps block over – head lighting which could disrupt a baby during sleep time. It is ideal for babies from birth to 15 pounds or until the baby can push on hands. It has wheels as such it can easily be moved from room to room. We recommend the bassinet as a valid competitor to our main picks. This is another close competitor of our chosen bassinets. It’s a safer alternative to bed sharing. It attaches to parental bed via an adjustable length strap that goes under the mattress but can also be used for stand-alone. The bassinet creates a cozy and superb environment and is ideal for breast feeding mom. The baby is so close such that you can hear her before she starts to grunt. It is a great bassinet for moms recovering from C- Section. Sides can be folded down and locked in place for a co – sleeper or stood up for use as a standalone. Mesh sides allow for easy breathability. The wheels are incredible and have a brake. We vouch for this bassinet incase our main picks aren’t available or should you want something different from our main picks that are equally good. Does a bassinet enhance mom’s bonding with the baby? A bassinet enables the mom to sleep closer to the child without the risk associated with bed sharing. The proximity allows the mom to reach easily in and soothe her baby. The result is an intimate relationship that cultivates bonding. Can a bassinet be used on both carpeted floor and bare floor? Yes, most bassinets can be used on both bare and carpeted floor. But, caution should be exercised by ensuring all the four legs are either on the bare floor or the carpeted floor. Is it appropriate to use a bassinet for twins? It is not recommended to use a bassinet for more than two babies at a given time. Which type of bassinet is ideal for a mom recovering from C-section? Mom recovering from a C- section birth is usually in pain and any form of movement increases the pain. Any bassinet that enables the mom to have easy access to the baby without movement is suitable. Hallo Bassinet Swivel Sleepers is most appropriate for such situations. It rotates 360 – degrees thus can be used on either side of an adult bed. A bassinet is one of those items a mom needs after giving birth. The choice of the ideal bassinet depends on the requirements of the buyer. There are those who need a specific type of bassinet. For those looking for a versatile and top notch bassinet, we recommend our top pick the Arm’s Reach Concept Co-Sleeper Bassinet Mini-Arc. It is a convenient bassinet full of features that any family with a newborn would need in a Bassinet. A mom who has gone through a cesarean section birth would need our step up pick the Hallo Bassinet Swivel Sleepers, its 360 rotating functionality allows the mom to be close with the baby and attend to her without much movement and strain. Our Budget Pick Delta Children Sweet Beginnings Bassinet is the kind of bassinet we recommend to any family that needs a humble bassinet that is affordably priced and which can hold its own when it comes to features and reliability. We also cared to select for you bassinets appropriate for specific situations. The straightforward and adorable Brica Fold N’ Go Travel is ideal for people on the move or an outing owing to its fold ability and portability features. The babyletto Bowery Bassinet, Expresso is for those who desire elegance and portability. We hope our information has provided you with the necessary awareness and knowledge on baby bassinets. Make an informed choice the next time you are buying a baby bassinnet.